Figure 1. Noah by Darren Aronofsky is bringing the biblical Flood to the attention of people around the world. The public interest in this film could spark new interest in the biblical account of Noah’s Flood. 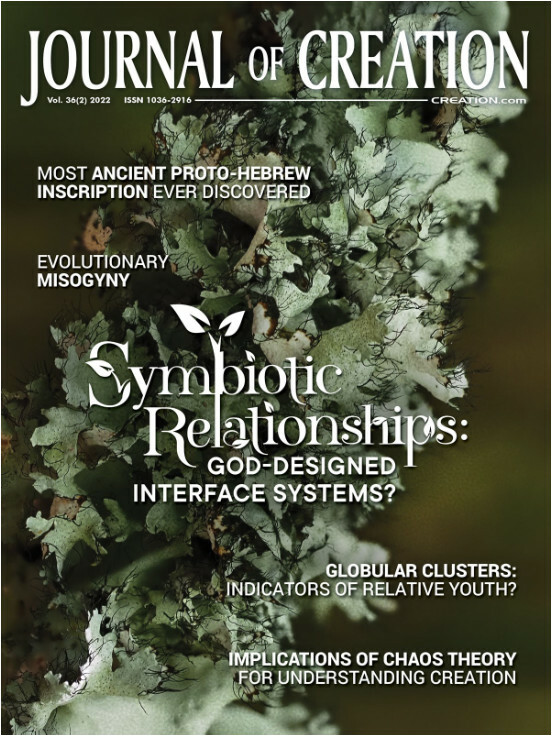 The global Flood is hugely significant for biblical geology. Mainstream uniformitarian geologists since the early 1800s have worked on the assumption that Noah’s Flood never happened. If it comes into their minds at all, they would dismiss it as mythological or imaginary. Let’s hope this film will raise questions in their minds. Is the film faithful to the biblical account? It seems liberties were taken in the way the characters and events were portrayed, and in the motivations behind what happened. That is understandable. Aronofsky wants to attract an audience and make a profit from the film. Some critics have described the film as biblical fantasy—a fantasy story developed around a biblical theme but only loosely constrained by the biblical account. Even still, there is enough in the film to generate new ideas for those who like to think outside the box. No one should feel intimidated about reading the Bible for themselves. The account of Noah and the Flood, and the immediate time afterwards, spans only a few chapters: Genesis 6 to 8 describe the Flood itself; Genesis 9 records events in Noah’s family after the Flood, and Genesis 10 and 11 includes remarkable cultural and genealogical information, relevant to every human on this planet. In one of the many modern translations available today the account is easy to follow. Figure 2. 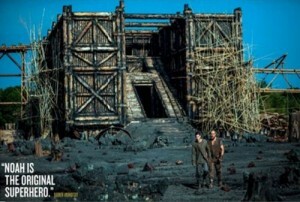 The Ark in Aronofsky\’s Noah is about the correct size, being a huge vessel. But it is too flimsy to do the job. One significant plus for the film is that it portrays Noah’s Ark as big (figure 2). It looks about the size the Bible specifies: longer than a football field, higher than a four story building. It’s massive. The film also portrays the Flood as being global, which is what the Bible clearly describes. That means it affected the whole earth, and that every person alive today has ancestral links to that event. The enormous size of the ark. A local flood would not need such a large vessel. That every kind of air-breathing, land-dwelling animal needed to be taken aboard in order to keep the kinds alive on the earth. That would not be necessary for a local flood. The waters covered the highest mountains. Even in the local area if water covered the highest mountain visible it would have affected the whole earth. The duration of the Flood. It was 150 days before the Ark came to rest on the Mountains of Ararat, and a further 220 days before the waters receded from the earth and the land was dry. The Ark came to rest on the Mountains of Ararat. The height of these mountains mean the Flood was global. It was 6 weeks before the tops of other mountains became visible after the Ark came to rest on Ararat. After the Noah and his family came off the Ark they were commanded to fill the earth. The Bible lists their family trees from which all the peoples of the earth are descended. 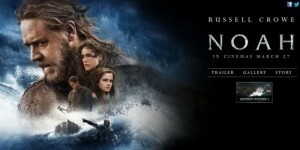 Aronofsky’s film reminds the world of Noah and his Ark. It was a huge Ark and a global Flood. If there was a global Flood as the Bible describes then what geological effects would it leave behind. Geology is a problem because, for over a century, geologists have presented their data assuming Noah’s Flood never occurred. The current geological paradigm, which is what mainstream geologist work within, is giving everyone a false lead. It’s an old paradigm that became popular in the early 1800s, and it assumes Noah’s Flood never happened. That assumption has led to unfortunate outcomes, which some have described as brainwashing, and others as buying ‘snake oil’. (See It’s time for evolutionist geologists to face the evidence.) These problems are only now being recognized and corrected, but there is a long way to go. In discarding the Noachic catastrophe geologists have needed to invoked eons of time to explain the rocks they see. 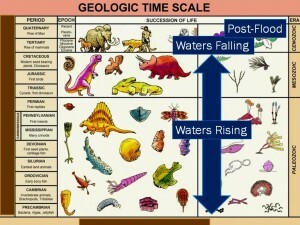 Consequently, because uniformitarian geologists have assigned dates of hundreds of millions of years, they are not able to see the evidence of the Flood. Figure 3. The geological column hides the Flood of Noah becuase it is constructed assuming the Flood never happened. 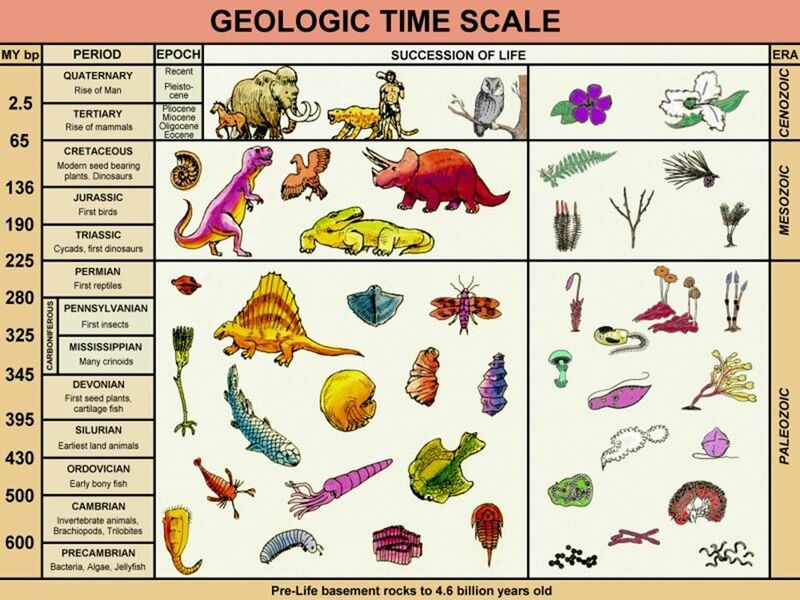 Geologists have carefully explored the rocks of the world and developed a table showing the various fossils found in different rocks in the order found on the earth (figure 3). These have been named after the areas where they were first explored. Jurassic, for example, is based on the fossils found in the Jura Mountains in Europe; Devonian on the fossils in rocks in Devon in England; and Cambrian based on the fossils found in the rocks in Wales. Geologists have assigned dates to the different rocks. However, because they dismiss Noah’s flood, the geologists have assumed the rocks took eons of time to form. 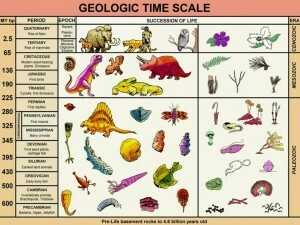 So, the chart has the Jurassic rocks being 100 million years old, and the Cambrian 500 million years. Thus, when a geologist looks at the geological column and thinks about Noah’s Flood and its geological impact, he looks the rocks right at its tip, at the ‘Recent Epoch’. Here the dates are 10,000 years or less. But that is the wrong place to look. If we want to find the evidence for Noah’s Flood in geology, we have to first assume that it happened. Figure 4. The geological column is a record of Noah\’s Flood provided it is intepreted properly. Most of the column was deposited as the floodwaters were rising on the earth. That means that the floodwaters covered the highest mountains. That also means the earth experienced a catastrophe. A catastrophe means that things happened quickly. That means the dates on the geological column, which are based on assuming there was no Flood, need to be reassigned. Thus, to begin with we remove the dates from the column, and analyse the rocks using the biblical paradigm. We find that almost all the column is a record of the progress of Noah’s Flood. (See The geologic column is a general Flood order with many exceptions.) Figure 4 shows how this works. Most of the column, up to the top of the Cretaceous, was deposited as the waters of Noah’s flood were rising on the earth.3 The portion of the column labelled ‘Tertiary’, above the Cretaceous, represents the period when the waters of the Flood were receding from the earth. This was a period of remarkable erosion when the landscapes of the earth were carved. Towards the end of the recessive stage of the Flood, once the receding waters had mostly drained, deposition again took place on the continents with the formation of local sedimentary basins. Will Darren Aronofsky’s newly-released biblical epic trigger a paradigm shift in our culture? It certainly has the potential. But it will require a revolution in geological thinking. Once you free yourself from the old fashioned geological paradigm of a pre-Victorian era, you will be empowered to see the world in a new way, and appreciate your place in it. It seems it’s not a film to take your children to. One review described its content as action violence and battle mayhem; disturbing images; brief sensuality; theological ambiguities requiring critical thought. Bible Gateway allows you to read the Bible on the web. You can choose from lots of different translations. The account of Noah begins in Genesis 6. You can click to the next chapter using the arrow on the site. The top of the Cretaceous for the peak of the Flood is approximate because the criteria used to assign rocks to the geological column are not the same as the criteria used to assign rocks to biblical history. Each location on the earth needs to be considered on its own features. Just wanted you to know that I did a write-up and linked to this article, here. Thanks for your work!